Living in the UBC area provides homeowners with access to so very many forms of outdoor recreation. This is no more true than with respect to golf. Golf is not just a sunny day sport over here, it is a lifestyle. Every home in our domain is minutes away from beautiful courses to accommodate varying levels of tastes and talents. Whether your swing resembles that of Arnold Palmer or Derek Jeter (do you have a baseball swing?) you can find your place on the green in UBC. In this week's blog post I am referencing a few points of interest for you and your household to enjoy come tee time. Play - Located on the University Endowment Lands, the University Golf Course is the best public course in Greater Vancouver. No membership is required to play the expansive course, shaded by tall pines, firs, and lush growth at every turn. The forested fairways are long and narrow, completing an 18-hole par-72 course that is perfect for all levels of skill and patience. Golf carts are available to maneuver the course but the casual landscape and warm spring, summer, and early autumn weather beckons players to walk from hole to hole instead, and most people do. For tee-times, green fees, and additional information visit the UBC Golf site here. Drive - While great practice for improving your par score, a driving range is also popular for those looking to whack the ball to release post work or study tensions. At the University Golf Course the 20 covered stalls and 30 sun kissed mats offer driving bliss through the entire year. The range is also stocked with 30,000 new range golf balls to ensure your drives remain true through each and every swing. Experience - For those of you seeking a golf experience off of the course then you're on the right track when in the UBC area where the BC Golf Museum and Hall of Fame stands off of West 10th and Blanca. This sport/lifestyle based museum houses the best collection of its kind in Canada. A walk through its heritage halls details the arrival of golf in BC (via Europe), its historical rise in popularity in the province, and its permanent place in the leisure and recreational landscape of our beloved region. 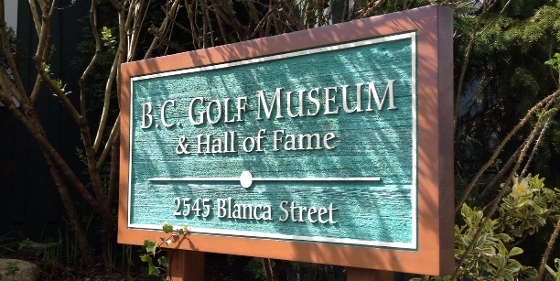 The displays and exhibitions within the museum include everything from vintage clubs and antique bags to books and photographic accounting of the history of golf in BC. I can't imagine a better golfer's paradise than a warm summer day out on the UBC green completed by a casual yet engaging stroll through the BC Golf Museum and Hall of Fame in the early evening. If you and your household consider golf a big part of your lifestyle and you are in the market for a new home then I encourage you to contact UBC Homes today. Perhaps we can discuss your real estate needs over a round or two.